"Americans aren't aware of the dangers of electromagnetic radiation. We're endangering ourselves from TVs, cellular phones, neon lights, electric light bulbs...It didn't have to be this way." Pregnant women exposed to 2.5 milli gauss for just 14 minutes per day have a 271% increased risk of misscarriages. We're constantly being bombarded by electromagnetic fields (EMF). Driving is no exception. Not only are we being fired at by cell towers strewn along the highways, and exposed to high magnetic fields along the roads by an overtaxed power grid, but our very beloved cars are one of the more problematic sources of EMF. The AC magnetic field impinged on the driver (passenger) of various makes and models is provided *. In general the intensity of the magnetic field provides a fair indication of how offensive a car may be. Magnetic fields are measured with gauss meters. One can obtain a meter such as the Trifield TF2 at various on-line stores such as LessEMF. The Trifield is under the category of "Combination Meters" because it measures magnetic, electric and Radio Frequency (RF) fields. "Trifield Meter TF2: Frequency Weighted"
The first priority is to get a car with a low magnetic field. However, the measured magnetic field doesn't tell the whole story and should not be the sole criteria used in investigating a car. For instance the magnetic field in the cabin of the Silverado is probably lowest of any modern vehicle. That is good start, but the vehicle still causes tinnitus, and other ill symptoms. AM radio interference indicates pelting of EMF from the ignition system. Pulsed noise from the ignition is not detected by either gauss or RF meters. There is also a computer just under the steering column (directly in front of the driver) which was also detected by an AM radio. Additionally, the main fuse panel is on the driver's side, the battery is on the driver's side, the digital instrument cluster produces RF, and there's a very high magnetic field throughout the entire engine compartment. Therefore, in the case of the Silverado the relatively low magnetic field at the vicinity of the driver can be deceiving. As we have seen with the Low Emission Computer ambient measurements can be negligible yet the computer can still cause devastating symptoms. Even if one doesn't initially feel any symptoms, in time one can become sensitized by the various low intensity frequencies of the EMF. It is therefore imperative to drive a vehicle on a long trip before committing to buy it. Though the short ignition wires tame the effects of the ignition, direct ignition is preferred. Conventional AC Delco spark plugs have double the resistance (about 8K Ohm) of the titanium plugs and significantly reduce RF measurements. - the battery is on the Passenger side of the car. - the magnetic field under the hood (engine compartment) is relatively low on the drivers side. - there are no computers near the driver. - the direct ignition of the six cylinder engine emits relatively mild EMF, and there are no ignition wires. A setback is the fuse panel under the rear seat, and of course the instrument cluster. Let's face it. Modern vehicles are laden with electronic gadgets, which leads us to investigate older vehicles. 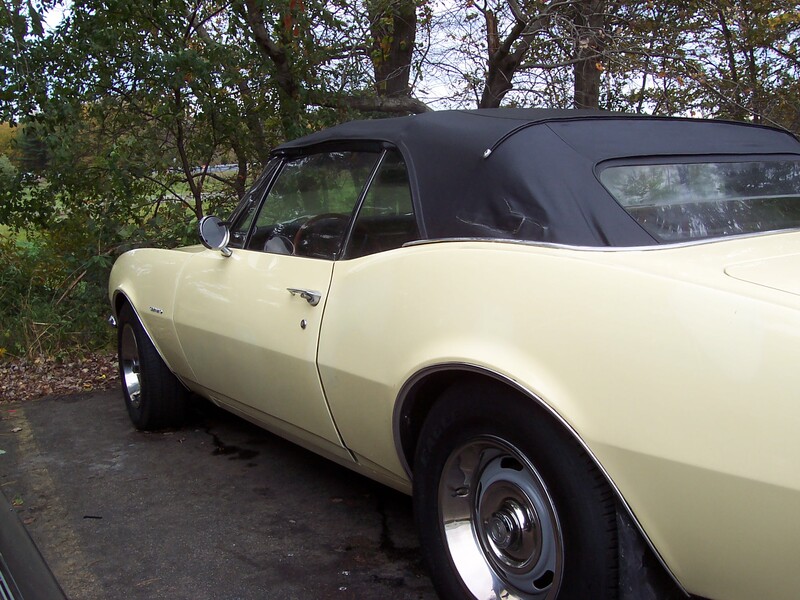 For instance the 1967 Camaro has a very low magnetic field in the interior. The biggest concern, which should not be taken lightly, is the 8 cylinder ignition which has a distributor behind the engine block, near the center of the firewall. The ignition wires are also very long compared to modern cars which place individual coils packs close to the cylinders, reducing the length of the wires (as with the Silverado). This particular vehicle has been retrofitted with a modern, electronic, High Energy Ignition (HEI) which has a hotter spark (40,000 volts) than the original points system (18,000 volts) and may explain why this car causes some chest pains (more on this when the original points ignition is re-installed). The metal dash must have beneficial shielding attributes. Needless to say there are no computers aboard, no electronic instruments, no electric fuel pump, no electronic fuel injection, and the interior dash lights are dimmed with a rheostat rather than an electronic switching mechanism. GM really blew it with the 2011 Camaro coming in at a whopping 50 milli gauss (100 for Passenger)! The highest rating of any tested vehicle. Probably the lowest EMF car one can get is a 1985 or older diesel Mercedes. That is if you and your neighbors can tolerate the exhaust fumes. It probably doesn't have air recirculation which is absolutely essential on today's stinking roads. Besides the 2011 Camaro and BMWs, one of the worst cars is a Saab. How ironic it is that the only country in the world that recognizes Electromagnetic Hypersensitivity as a disability would produce such a dreadful vehicle. Here's the list of low-mid frequency magnetic field ratings of various cars. Driver Front Floor: 12.0 milli gauss. Driver: 15.0 milli gauss, Passenger: 3.0 milli gauss. * Measurements were taken with a TriField meter (Frequency Weighted) at the breast of a 5' 10" individual sitting in the seat with all accessories off (including interior light dimmers). The ambient field is negligible. Floor measurements are taken at the calf. These are not exact measurements, as there can even be a difference in readings between two Trifields. These readings can be used as a guide on the relative strength of the magnetic field emitted by cars. Most of the magnetic field is produced by the alternator and ignition. Yet something as simple as a dimmed interior light, or a built-in navigation system can cause an elevated field.